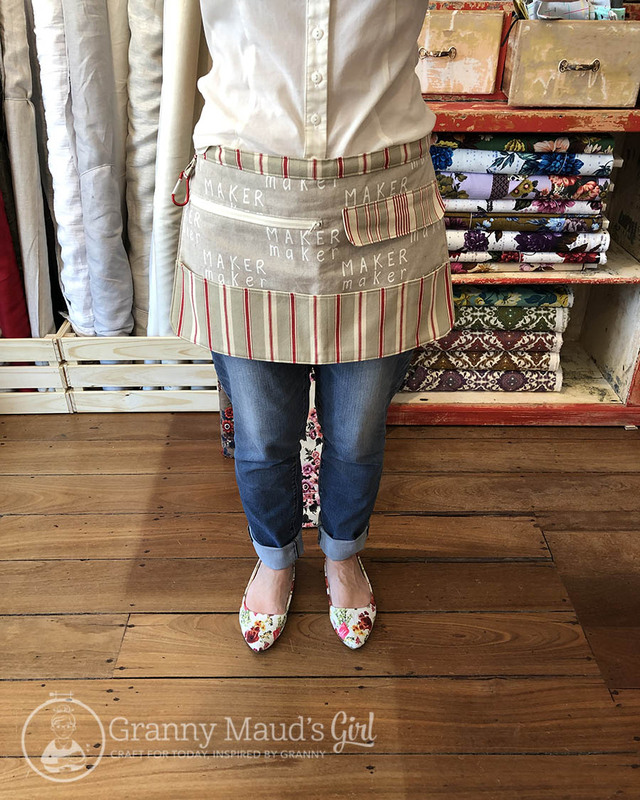 Because I am again working casually at Calico & Ivy, I thought I would make an apron to carry a few handy bits and pieces about. The phone, especially, seems to like disappearing under bolts of fabric. When it rings, the first thing we must do is find it! When I grabbed a colleague to take a photo, I had not yet stuffed my pockets with phone, pen, notebook, etc. I cut the waistband and ties on the straight grain, not the bias, so that they did not stretch out of shape. I also cut the waistband strip 3 inches wide so it finished at a full 1 inch wide (with ½-inch seam allowances). If using quilting weight cotton and not cotton drill, I would have added some interfacing to the waistband. I omitted the business card pocket and the button on the flap pocket. I had a button chosen but decided to leave it off. I am right-handed, so I swapped the side of the loop thing. I evened out the spacing of the zipper and the flap pockets, and I extended their lining up to the waistband for extra support of the pocket contents (droop avoidance). I bought 30 centimetres each of the striped cotton drill, the text linen and plain calico for lining. I really needed a lot more of the plain calico – perhaps twice as much – and ended up having to add remnants of other similar fabrics from my stash. 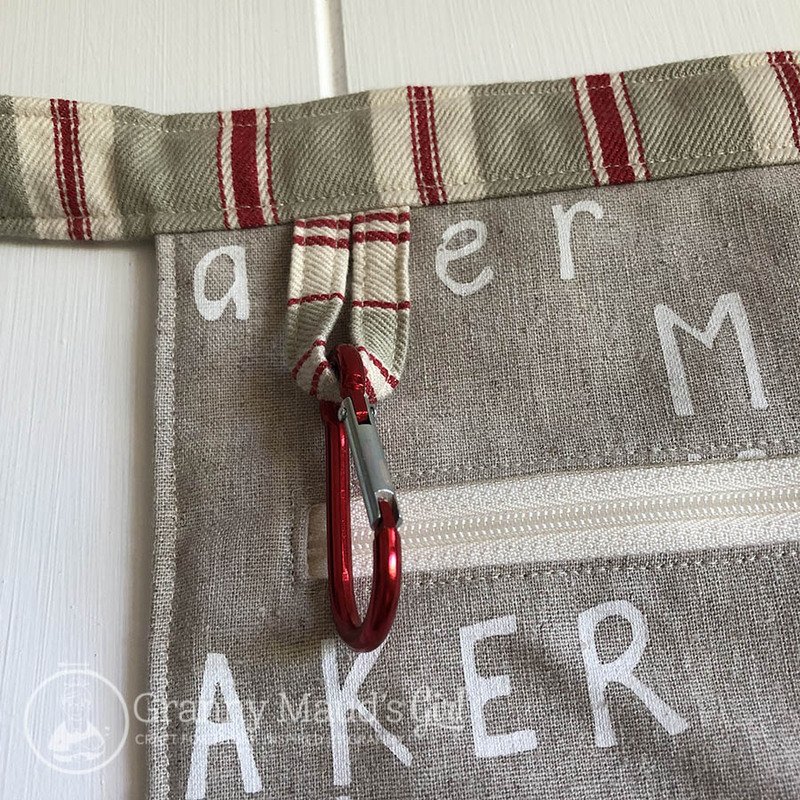 If you use the tutorial, note that the measurements are often finished measurements, not cut measurements, and you need to add seam allowances; they are often not included. 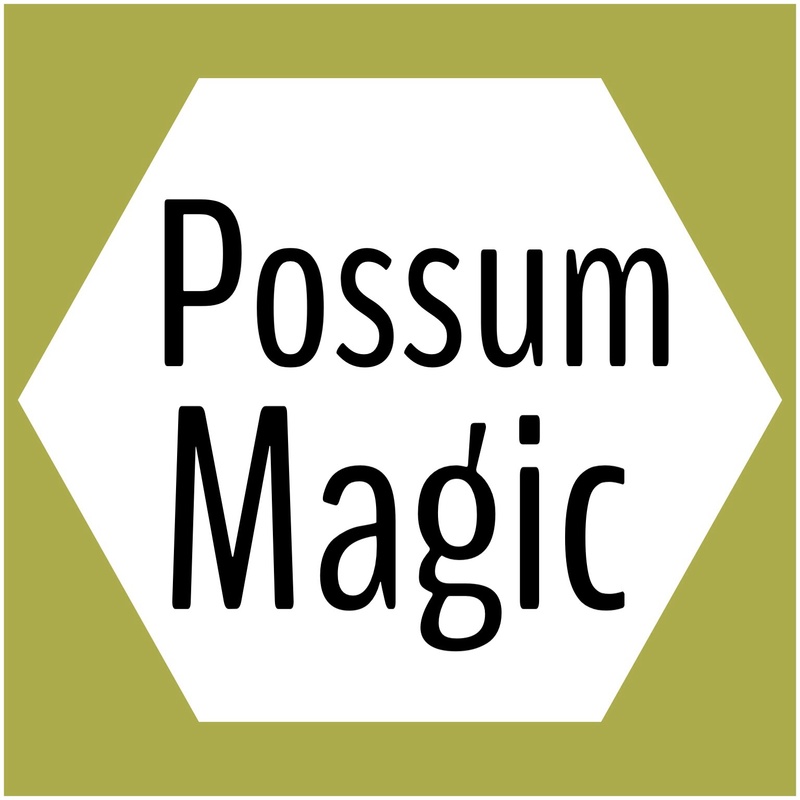 With this one clue, everything else should make sense. The pattern piece that is taped together is a great guide and is what I refered to before cutting. 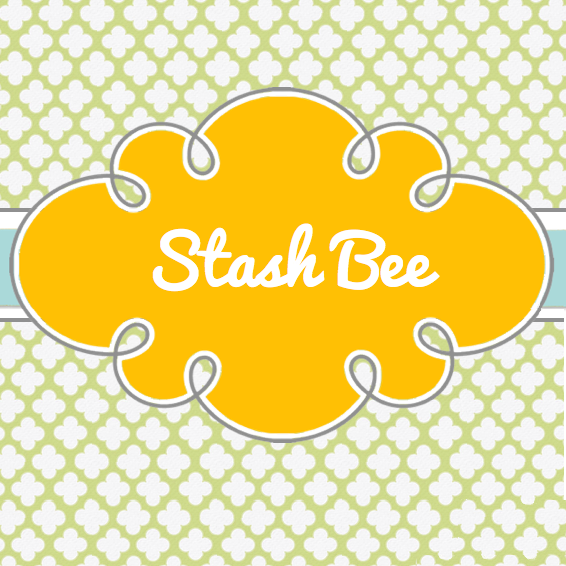 It is an easy project that can be sewn all in one day, even if you are slow and easily distracted as I am. 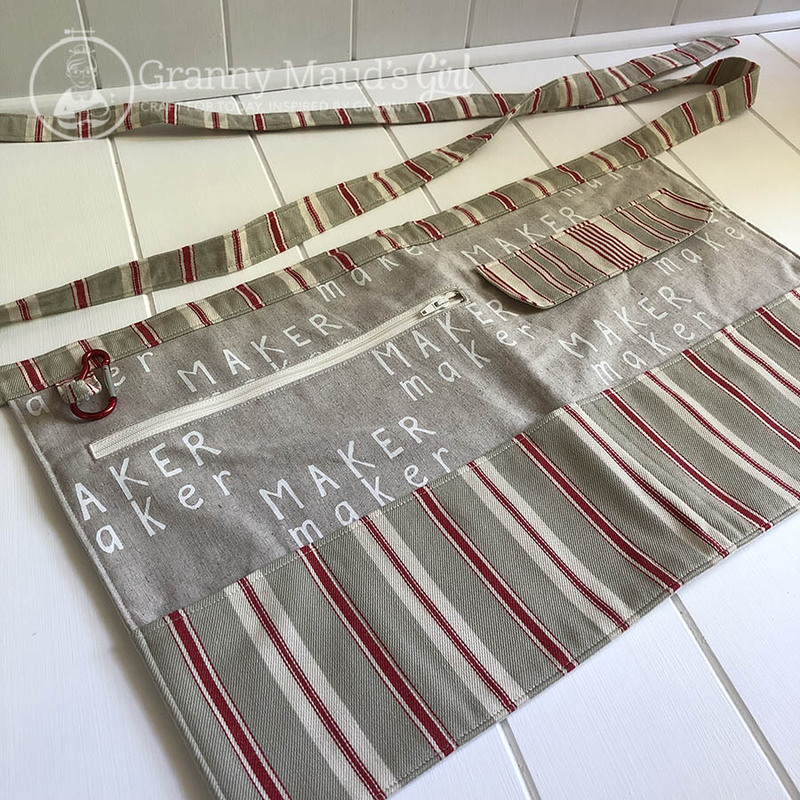 The main pocket has five sections, which have proven to be the perfect size for a rotary cutter, a notepad, the shop phone, a pen and the storeroom key. I confess that I have not yet used this pocket. I am not sure what I will use this clip for, but I had the hardware and it was in the pattern. The ties are long enough to go around my waist twice or tie a really big bow. The ties are long enough to go around my middle twice, but the apron sits much better if only wrapped once and tied in a big bow at the back. I can see this being handy not only at the shop but also on craft retreats. 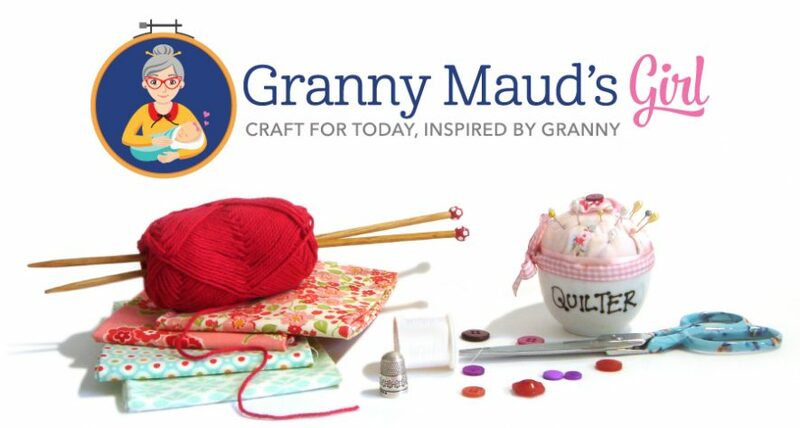 My mum was telling me about a knitting apron that Granny Maud made her when Mum was trying to give up smoking. Mum could keep her knitting handy and knit to distract herself whenever she craved a cigarette. It was much simpler: just a generous pocket like a kangaroo pouch. 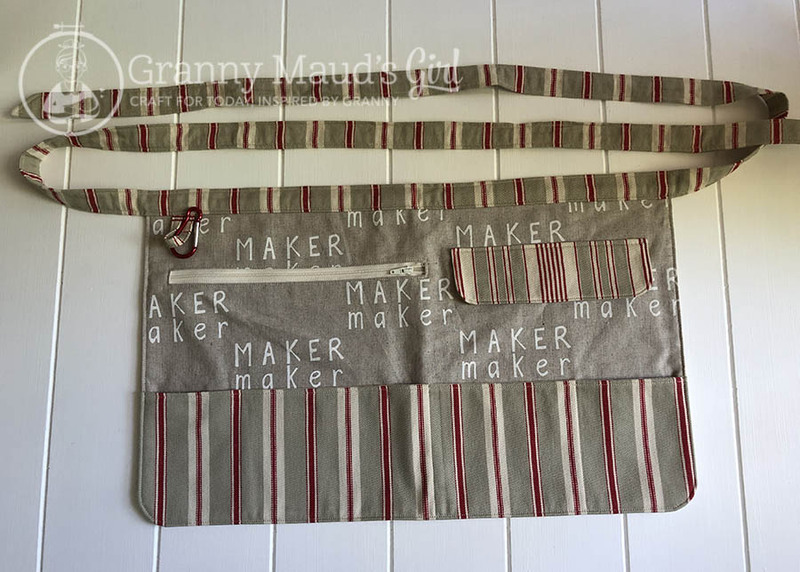 I have never smoked, but perhaps I need a knitting apron too so I can knit on the go! Or even a Shetland-style knitting belt. If you have to lock the cash register, perhaps that carabiner could be used for the key? Or maybe a small pincushion with a loop on it? I’d hang my rotary cutter from it, myself. 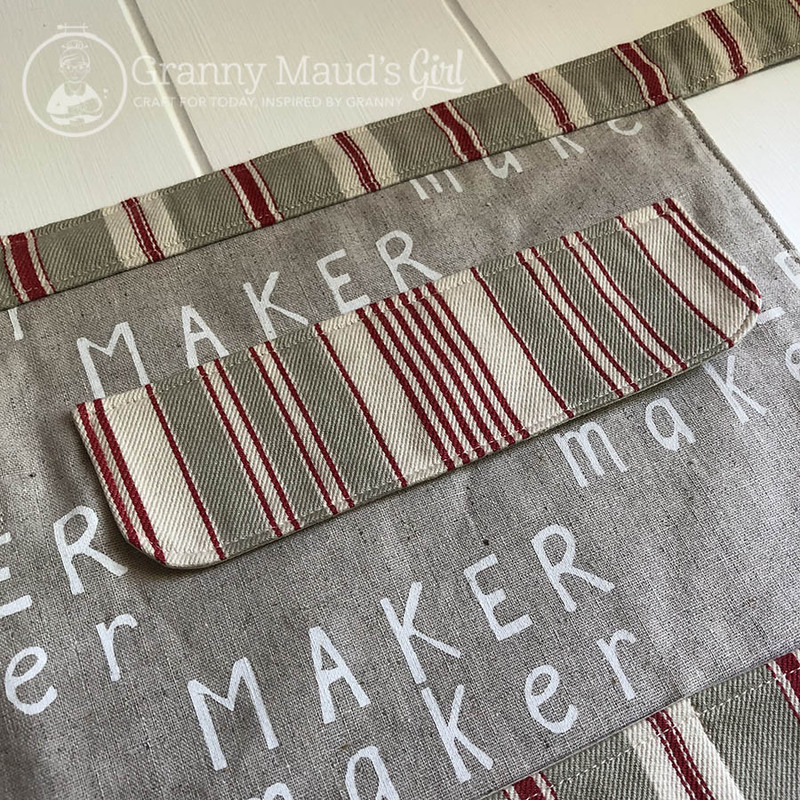 Lovely apron, smart as well as handy. I can imagine this being useful for the garden…handy for all sorts of implements! Nice fabric choices too! This is awesome. That maker print is amazing. I think I’ll bookmark this future. If you are the model, you look great! The apron does too! I’m afraid I would be losing my phone everywhere without the apron as well. I love this every detail of this pattern. From the zippered pocket to the little loop with the clip hardware – it’s perfect! I would totally make this if I knew of a reason to wear it.